We're shortly going to release the results of our new study delving into BPO talent, which probes into whether there is a genuine career path to follow for BPO and operations professionals, or whether we're terminally stuck in the "accidental career" we never intended to venture into. In anycase, I wanted to share one set of data points that show which skills have been increasing in significance. Over the past year, the skill where demand and expectations has become the most elevated, more than any other, is automation. 65% of service buyers and 69% of provider professionals cite the need to understand and deploy automation is significantly increasing as a skill requirement - and even 61% of advisors are feeling the pressure to knowledge-up. Essentially, as the room for additional cost savings diminishes for BPO buyers, the logical next step is to reduce manual tasks (and ultimately unnecessary labor costs). With the heavy marketing coming from service providers and technology firms offering robotic process automation (RPA) solutions, the awareness from the buy side – and pressure on operations managers – to have a more defined, measurable automation strategy, has never been as intense as it is today, and is likely to crescendo for some time to come yet. At HfS, we are getting calls every week from buyers wanting support developing an RPA plan for their business - it's becoming the new efficiency drive for many experienced BPO buyers. 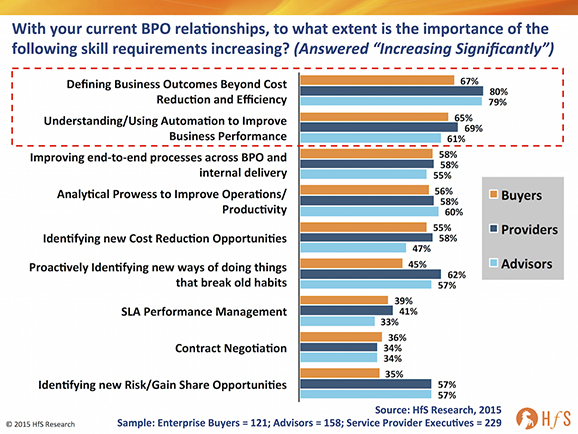 Whatever actions buyers eventually take with RPA, they at least need to have some sort of strategy developing to placate the higher-ups questioning where their next 20% of productivity benefits are going to to come from. RPA provides that logical first step for buyers and service providers to reduce their reliance on throwing lower cost human labor at problems. It provides the building blocks to develop more streamlined end-to-end processes, to perform more meaningful analytics, to create more of a digital infrastructure across the business. Essentially, RPA is the new arbitrage for many, but is unlikely to yield massive cost-savings in the near to medium terms – it is more about helping enterprises deploy their talent on higher value activities. In short, RPA is about working smarter, not cheaper. I agree its about working smarter, not cheaper, but ultimately RPA will eliminate jobs that are purely administrative. How quickly do you see this impacting? What will the effect be on the workforce, Phil? @Jeff - process automation isn't anything new. It has been around for decades (and many centuries if you wanted to go pre-computers!). In manual jobs, automation has a huge impact on labor, for example when new manufacturing plants open up these days, they rarely employ the sheer numbers of workers they did in the past (plants that may have employed 2,000 in the 70s and 80s today many only need 100 workers to operate robotic machines). When the self-driving car becomes the norm, it's impact on truck-drivers and other driving jobs will be severe. With knowledge jobs, such an finance, HR, procurement, claims management, healthcare admin, data management etc., the impact of automation is different. You can't eliminate an entire job position because it becomes 30% more efficient through automation - you still need that worker to manage the process with the hope they can spend more time refining the operations, taking more time to analyse data / make more proactive customer calls / take on new projects or initiatives. The bigger impact will be profiles of staff organizations seek to hire in the future once they achieve better automated infrastructures. This is a good thing, IMO, as people will be forced to reorient their skillsets to add more creative value to firms / be more proactive and aligned with the business. It amazes me when you talk to many operations staff today how disconnected they are with the core business product or service. The more we can automate the lower value work, the more effective and competitive our organizations will become, and the more relevant (and career focused) smart operations people will become. We can't let organizations fester in inefficiency in this era - not having well automated processes impacts the ability to have better analytics, better cognitive capabilities etc. Net-net automation of processes will not result in massive layoffs, but more a gradual shift in how organizations hire, train and develop their staff.